To create the handle for your treat cup, measure and cut a 10-inch long piece of rainbow duct tape. Fold the length of the tape by one-third onto itself, leaving one-third of the sticky side showing. Fold the sticky third down onto the first fold of tape so that no sticky tape remains. Cut a small strip of tape and attach it to one end of the handle. Repeat at the other end. Cut another small strip of tape and roll it up, sticky side facing out. Put the three large sequins together to form a clover shape. Place the rolled tape in the center of all three to hold them all together. Stick the rolled tape side to one side of the handle on the cup. Press the medium sized sequin onto a glue dot and pick it up, then press it to the center of the clover. Fill your cups with toys, trinkets, candy and whatever loot you desire! 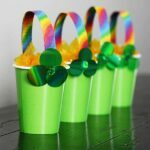 This project for End of the Rainbow Loot Buckets was printed from CraftsbyAmanda.com - https://craftsbyamanda.com/end-rainbow-loot-buckets/ and can only be printed for education or personal use.